Installation should make people with knowledge of web servers and applications designed for use on the Internet. The first element that needs to be done is to install a system for sending group e-mails. Or to load files to the server, it is best if they were directly in the domain or subdomain. This is an important issue because of problems with some of the active elements by taking the main path. Files and folders can be uploaded to the server using a program intended to FTP such as the free FileZilla Client. After uploading the data to the server in the web browser, go under the domain, after it enter the install.php file, domain is http://phpbluedragon.eu/ and entered our address: http://phpbluedragon.eu/install.php. Our eyes will see a software installer. Under the first point of the field Select Language choose the option, and then click on the Change button language. System requirements are basic server options for web pages that must be met. Otherwise, the installation will be impossible. These include the PHP interpreter is at least version 5.5.0, stream_socket_client function() you need to contact the SMTP server and the library MySQLi – required to connect to the database. Correct operation of the system requires us to give proper access rights to directories that are checked in the installer. Any rights not satisfied that it will be impossible to install the system. We have here catalogs: uploads – for you to upload files to the server, captcha – a folder for images CAPTCHA hinder the robots to send the forms available on our website. When using any of the folders will appear in red to change the permissions on the directory. This can be done for example by right-clicking on an item in the server, and then select the option to change the permissions or issue commands using commands. Equally important it is to give the appropriate rights for files to be overwritten with data from the form in the installer. In step 4, the installer will check access to components and displays a message. File autoload.php – is a file that allows the automatic loading of additional libraries and modules to the system to send group e-mails. The config.php file is saved system configuration data such as the URL or data to the mail server, and file database.php – intended for data storage, through which the program is able to connect to the database. The path through the URL is the location of the system in which the master file index.php. URL field location system is already filled and we do not have it better. The second field E-mail administrator for the e-mail address primary user of the system. From this account, we will send all alerts from the system to the user. Configuring the primary SMTP server used by the system to send e-mails from the system to users, such as password reminder. Field name the person/company sending the e-mail address is being spent on our name or the name of the company in which we work. It will be displayed label at the email address in the sender field. SMTP server address – the field should be completed at our SMTP server will often be smtp.ourdomain. Login to the SMTP server – in this field enter the login server, and then in the password for the SMTP server user password, which we have given above. The last option is the port for the SMTP server that is already completed and should be changed only when we are convinced that a port number other than the one specified in the configuration. Number 587 is currently the most widely used. The most important step is to provide data to the system to connect to the database server. Server Name field – it is intended to enter the address of the host database server. 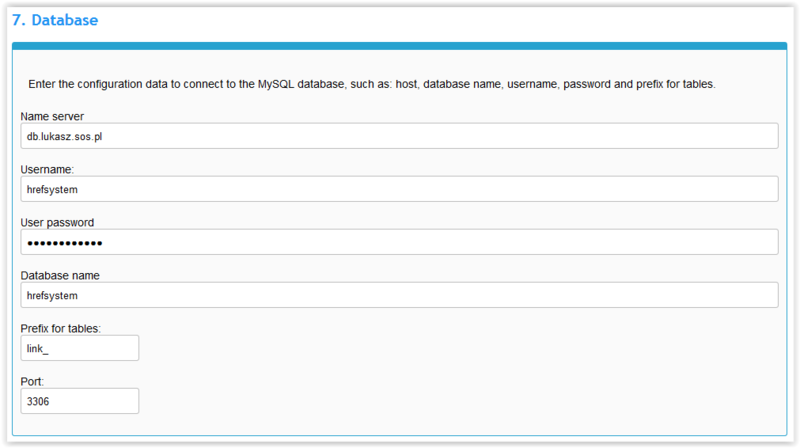 In the User Name field, enter a login to the database, and the User Password is the password to access the database. The field Name of the database is designed to introduce the database name, which will be installed on the system. At the very end there is a Prefix tables – a useful feature when the database tables already exist from another system, then using the prefix we can give them another text preceding. If there is no such need not modify the content of this field. When all the data has been entered you can proceed to step click the Install button. After a short time page appears, which will be located login and password to the system. Remember to copy the data to a safe place.